Carrolle Devonishh has developed a passion for beading since her retirement; she has been working with beads since a trip in the early 90s to Kenya. 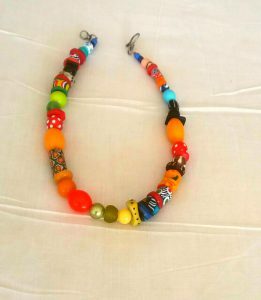 She found the beads wonderfully earthy and has used African beads in many of her pieces. She collects beads from friends and from occasional bead shows. She especially loves African beads and continues to collect on her travels there. Recently she has become interested in Swarovski crystals and hopes to develop some crystal creations. She has lived in Anguilla since 1998. Courtney Orlando Devonish is a Barbados born sculptor/potter who has attained an international reputation for his creations in wood, stone and clay. 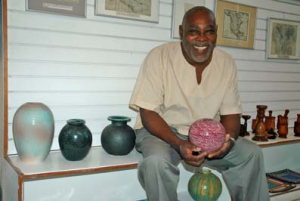 He has been residing in Anguilla for over 20 years, and the Devonish Art Gallery is the permanent showroom for his creations. Courtney began his art education at Birmingham University School of Education in England, where he majored in arts and crafts, specializing in sculpture. 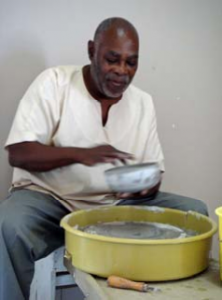 He did post-graduate studies in Italy under the auspices of an OAS fellowship in ceramic technology. He has been featured in many English and Caribbean publications, Courtney’s work has graced the pages of Le Figaro of France, Fielding’s Travel Guide of North America, and Seura of Finland. 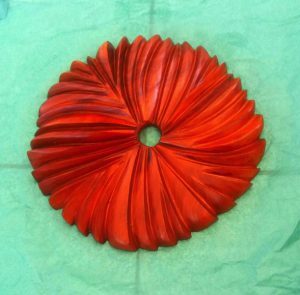 Courtney’s work can also be found in many private collections throughout the world. Some of his pieces have been bought by the Government of Barbados to be presented to international heads of state, including the President of the United States (1982), the President of Venezuela (1981) and the Prime Minister of Australia. 1988—current. Devonish Art Gallery is now located in Anguilla, BWI. Interesting site you have here! In the section above, would i be right to be expecting to see pictures or photos next to the 2 introductions? It looks this way from the formatting but there are none above. It would be helpful to add in some photos of the various exhibitions as that would provide readers with a greater appreciation of your artwork? Great job and keep it up. Thanks for visiting , comments and encouragement, There are images of artwork on the site if you click Courtney’s Art work but will look into posting a teaser,I am still in the infant stages. Hi. Such an amazing accomplished artists the both of you are. As an artist myself I can appreciate the time and devotion one takes to perfect the your art. To be able to meet the president of the United State that just amazing. One day I hope I can be at the level you have achieved. Thanks for the comments, and viewing the page; i was lucky to have meet the Queen of England twice ,once on board the Royal Yacht, President Raegan of USA and Prime Minister Trudeau Senior,former Prime minister of Canada and many other celebraties throughout my art career, sorry to say i am not a star struck person, but my most exciting meetings were with Prime minister Trudeau in Barbados, in my gallery without body guards and we had a wonderful conversation and a famous very beautiful model and her mother in my gallery in Anguilla.,exciting because of her beauty and intellect.I also prepared dinners for several years for a couple with whom i developed a close friendship, it was only when two american friends were having dinner with us at my home that i discovered that the husband was vice president of a famous american company, until then i only knew their names. Are any of the sculpture pieces pictured here for sale? I ALREADY OWN ONE OF YOUR WOOD SCULPTURES. Visit devonishart.com -gallery Courtney for sculptures.–Fine craft gallery for hearts etc and gallery Carrolle for jewellery.The prices are on the paypal button.just click. Wow, you do some amazing artwork…I really love the carvings you’ve been creating here and the jewelry done by Carrolle as well. As an artist myself, I certainly can appreciate the care and time you’ve both spent on your beautiful creations shown here. I’ve never tried wood carving, and have only done a tiny bit of pottery making in school when I was many years younger…guess I’ve kept myself quite busy with drawing and painting over the years, so the skills it takes to create the sculptures and carvings you’ve done are beyond my range! You certainly have quite the accomplishments you’ve achieved in your years as an artist…it must have been amazing to meet all the well known people you have met through your artistic endeavors! Keep up the awesome work you’re doing here… I’m looking forward to seeing more of your and Carrolle’s wonderful creations! Best wishes to your continued success in 2018 and years to come! I enjoyed my visit to the gallery when Tony and I was there in July. Looking forward to our next visit. Thank You, we look forward to seeing you again.Hope you enjoyed Anguilla. WoW! This is very much eye catching work. Very detailed and unique. Thank you; have you any ceramic experience? Wow, these are some amazing accomplishments! This is beautiful artwork – will you post more photos? I draw and paint but have never tried to sell or place any of my work in a gallery. I am always so impressed with people like yourself who have made their work public. Your educational credentials are also quite impressive. I live in Seattle, Washington – way up here in the Northwest corner of the US – so far away from your tropical paradise! I hope someday to come to the Caribbean and see your work in person! Nice to meet you, actually my wife was born in Seattle, I visited once and loved the mountain, I was there for 2 weeks in the summer and it never rained.. Have you ever shown your work to a gallery or entered any exhibitions; you should try. send me some photos of you work-devonisharte@gmail.com. Glad you like the work; have you thought of a website for your art? I really enjoyed reading about you two. I have to say i am really impressed with your work. I really enjoyed looking at the pictures of your various art work. I love the attention of detail you put into your crafts. If someone as me would want to start sculpturing do you have any tips how to get started? Thanks for visiting, most of my work is about shape,form, emotion and touch.I am happy you liked the work. Whenever I am taking a class for the first time, I always give them a small piece of clay and ask them to show me what they can do with the clay; That is a first pointer of their capability and evidence of creative spirit. Try it and send me a photo.Good luck to a new beginning. Do you have any works by Peg Gregory still in the shop? What size and price if you do please. Thank you; How are you, yes we have 2,-12″x 12″ and 20″ x 2o” $300 and $700 respectively.